Joists are selected to meet strength and stiffness requirements. Strength requirements depend on the loads to be carried. Stiffness requirements, on the other hand, are intended to limit cracking of ceiling finishes under live loads and, even more important, to limit vibrations from moving loads, often a cause of annoyance to occupants. Wood floor joists are generally 2 in. (38 mm) thick and either 6, 8,10 or 12 in. (140,184, 235 or 286 mm) deep. 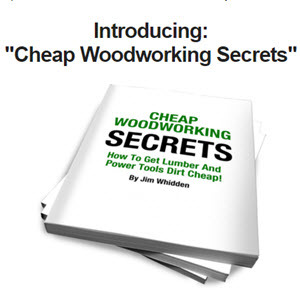 The size depends upon the loading, length of span, spacing between joists, the species and grade of lumber used, and the deflection which may be allowed. Tables 15 and 16 show the spans which are allowable for the various grades and species of lumber and for different loading conditions. 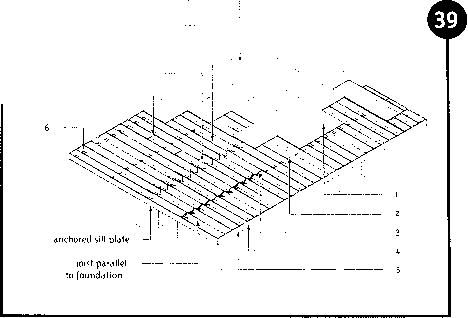 The allowable spans shown in these tables are measured between inside edges of the joist supports and have been calculated on the basis of lumber dressed to standard Canadian sizes. Alternatives to dimension lumber floor joists include laminated veneer lumber joists, parallel chord trusses and wood I-joists. Allowable spans for these engineered wood products are provided by their manufacturers. Where a sill plate is used, the joists are installed after the sill plates have been leveled on the mortar bed and anchored to the foundation wall. As already described, where joists are embedded in the top of the foundation wall, they are Installed before the foundation wall is placed. The joists are located and spaced according to the design. Floor framing: (l) subfloor nailed with 2 in. (51 mm) nails to joists; (2) 1 x 3 in. (19 x 64 mm) continuous wood strapping nailed at bottom with two 2 '/i, in. (57 mm) nails; and/or (3) 2 x 2 in. (38 x 38 mm) cross-bridging at midspan nailed with two 2 1/4 in. (57 mm) nails; (4) header joist end-nailed to joists with three 3 '/¡, in. (82 mm) nails; (s) header toenailed to sill plate with 3 1/4 in. (82 mm) nails 24 in. (600 mm) o.c. ; (6) floor joists toenailed to sill plate with two 3 >It, in. (82 mm) nails, one on each side. Any joists having a slight bow edgewise should be placed with the crown on top. A crowned joist will tend to straighten out when the subfloor and floor loads are applied. A header joist is end-nailed (Fig. 39) or toenailed (Fig. 35) to each joist. In platform construction, each joist including the end joist parallel to the exterior walls is toenailed to the sill (Fig. 39). The inner ends of the joists are supported on top of the beam (Fig. 31) or framed into the side of the beam (Fig. 32). When a loadbearing wall runs parallel to the joists, it should be supported by a beam or loadbearing wall in the basement. Framing for floor openings where double headers and double trimmers are used: 0) second header nailed to first header with 3 in. (76 mm) nails spaced 12 in. (300 mm) apart longitudinally; (2) first header nailed to tail joists with three 4 in. (101 mm) or five 3 >/« in. (82 mm) nails; (3) second trimmer nailed to first trimmer with 3 in. (76 mm) nails spaced 12 in. (300 mm) apart longitudinally; (4) first trimmer nailed to second header with three 4 in. (101 mm) or five 3>/* in. (82 mm) nails; (5) first trimmer nailed to first header with three 4 in. (101 mm) or five 3 '/¡, in. (82 mm) nails. wall supports one or more floors, unless the joist size is designed to support such concentrated loads. Non-loadbearing partitions parallel to the joists should bear on joists or on blocking between the joists. This blocking should be 2 x 4 in. (38 x 89 mm) lumber and spaced 4 ft. (1.2 m) or less. When framing for large openings, such as stairwells or fireplaces, trimmer joists are doubled if they support header joists more than 32 in. (800 mm) long. Header joists longer than the 4 ft. (1.2 m) should also be doubled. Where unusually large openings occur, trimmer joists that support header joists more than 6 ft. 6 in. (2 m) long and header joists that are more than 10 ft. 6 in. (3.2 m) long should be designed according to accepted engineering practice. 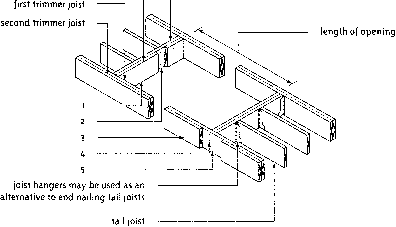 Nailing and assembly methods generally used in the framing of floor openings are shown in Figure 40.
joist hangers are often used to support long joist headers and tail joists. Joists may be kept from twisting by cross bridging, blocking, strapping or a ceiling finish fastened to the underside of the joists. Where a board-type finish is not used, necessary restraint should be provided at intermediate locations between the supports and at distances not greater than 6 ft. 10 in. (2.1 m). Intermediate support may be provided by the following methods: 1 x 3 in. (19 x 64) mm or 2 x 2 in. (38 x 38 mm) cross bridging or 2 in. (38 mm) full-depth blocking fastened between joists together with continuous wood strapping of 1 x 3 in. (19 x 64 mm) nailed to the bottoms of the joists. 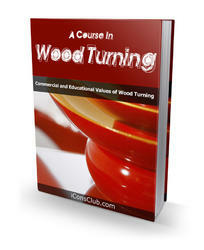 Continuous wood strapping, however, is not required where ceiling finish is provided. The floor joist span tables incorporate vibration criteria. The tables recognize that different floor constructions are more "bouncy" or "springy" than others. Therefore, by adding blocking, or increasing subfloor thickness, floor joist spans may be increased. Alternatively, engineered wood products such as laminated veneer lumber joists, parallel chord trusses and wood 1-joists may be considered. Is a floor joist or i beam set first in house construction?